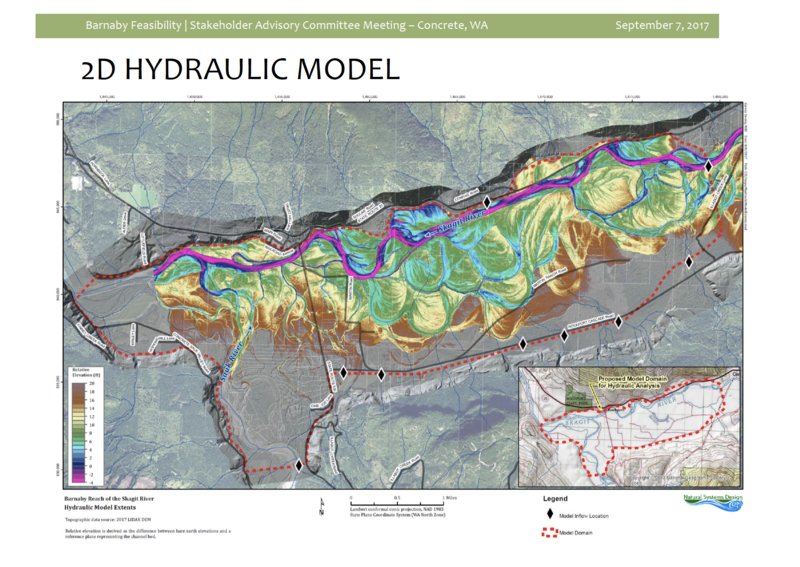 The Barnaby Reach Project’s Stakeholder Advisory Committee met on September 7, 2017, in Concrete. 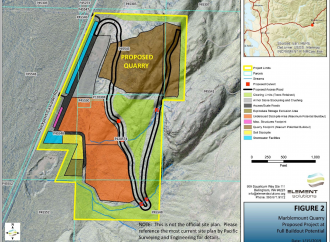 This committee is composed of representatives of the significant area stakeholders in the project, including: designated representatives of residential land owners; the National Park Service, the Washington Department of Transportation, the Washington Department of Natural Resources, and Skagit County. Our designated neighbor representatives are: Russ Dalton, Christie Fairchild, and Howard Stafford. 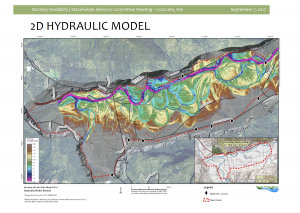 Representatives of the project sponsors at the meeting were: Devin Smith, Skagit River System Cooperative; Bob Warner, Washington Department of Fish and Wildlife; Erin Lowery, Seattle City Light; and Jenny Baker, The Nature Conservancy. 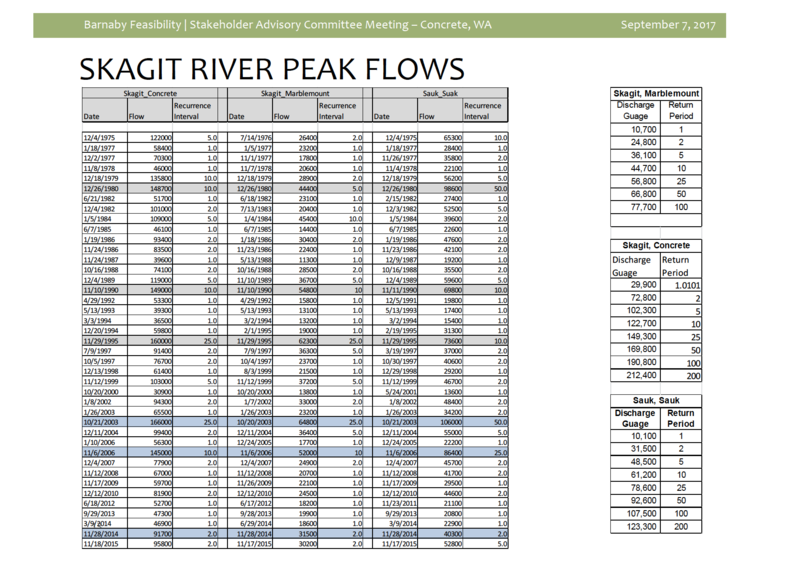 The main purpose of the meeting was to “hear and discuss preliminary findings and potential options for reducing flood impacts in the south Rockport area; hear and discuss proposed work plan for flow scenarios to model for assessing Barnaby Reach Project options; hear and discuss other project updates.” In this article we share the highlights of the meeting along with our views and judgments. 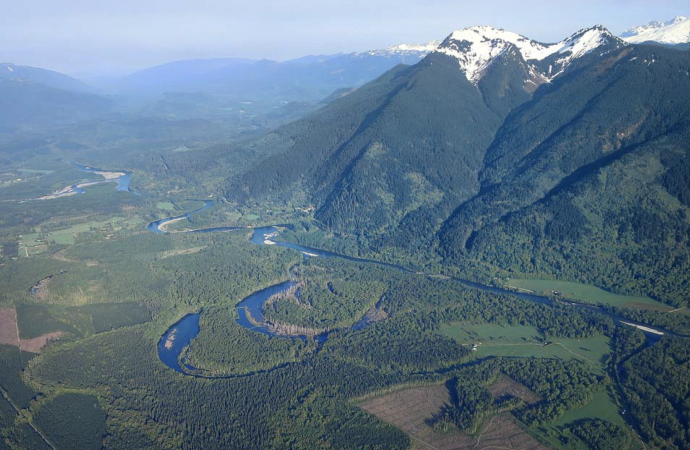 The Skagit River System Cooperative maintains a website for the project where meeting reports are available for review, along with other information about the project. You can find the website here: https://barnabystudy.wordpress.com. Quotes here that aren’t attributed to one of us are from the meeting notes prepared by Cynthia Carlstad of Carlstad Consulting. Russ Dalton and Howard Stafford toured the area with NSD consultants to note features and situations they know relate to local flood and drainage issues. 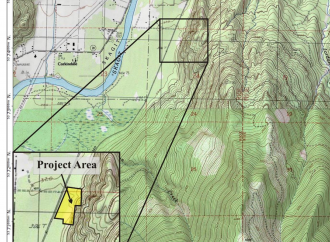 Some of the findings so far include: 1) some culverts appear to be undersized; 2) there are places where new culverts would help with drainage; 3) many smaller drainages off hillsides do not have culverts; 4) Martin Road floods early near the 90 degree bend adjacent to the Bord property; 5) there is a swale that runs through the area that doesn’t have a culvert; 6) raising the road or adding a culvert would help with access during flooding. A full report will be presented at a community meeting in December. 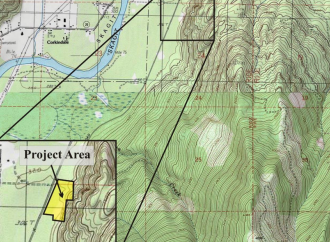 A significant research aspect of this project is the collection of precise topographic data revealing the elevations in the project area. 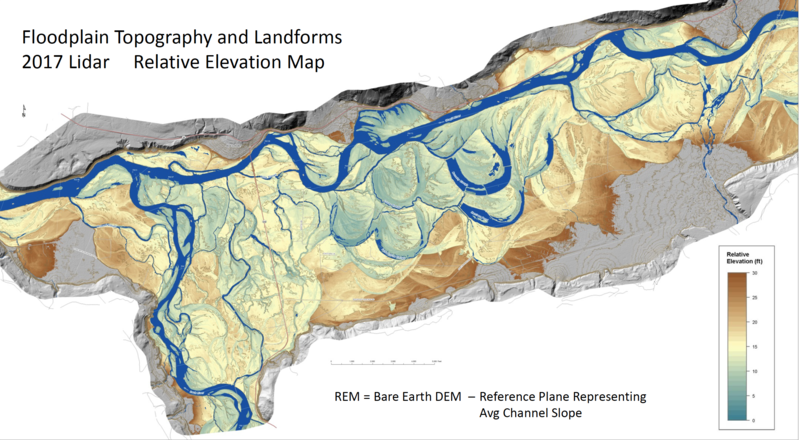 Technology called “green LIDAR” was used to produce the following “relative elevation map” (REM), which shows “the relative difference in elevation between the water surface and surrounding ground.” Leif Embertson of Natural Systems Design, a consulting firm, stated that, “the REM is an important analysis tool to help predict what areas of the floodplain are the most closely connected to the river. 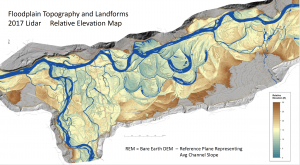 “LIDAR” stands for “light detection and ranging,” a sensing method that uses light in the form of a pulsed laser to measure distances to the earth. 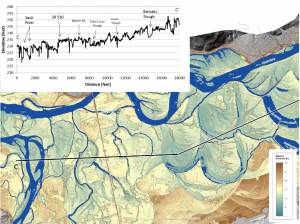 This Relative Elevation Map is helpful in visualizing the fact that the elevations of the area of sloughs is very close in elevation to the Skagit River. Everything tinged blue is within five to seven feet of the Skagit. (Click image to enlarge). Here is a closer view that includes a graph showing the observed elevations of a cross section of the area (A to A’). (Click to enlarge). 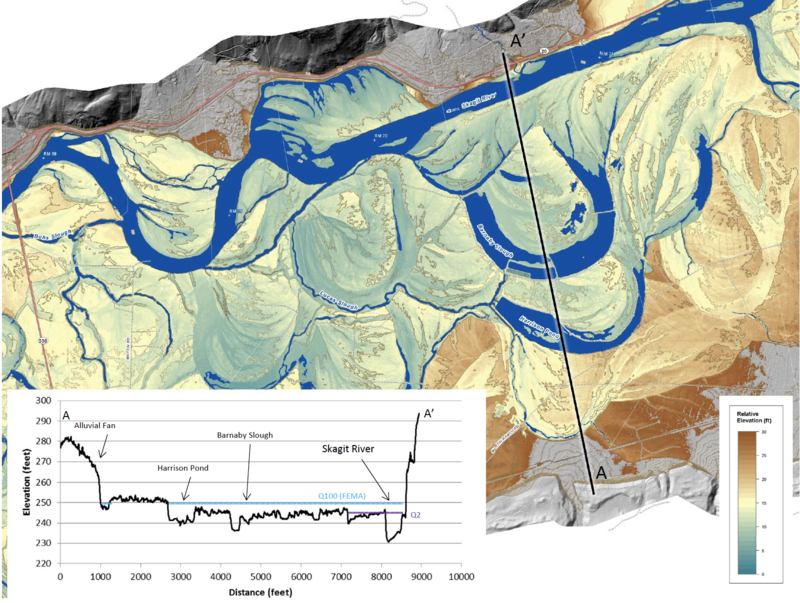 Here is a map reflecting a hydraulic model that shows the elevations of bare land relative to the channel bed of the Skagit River. (Click to enlarge). You can visit the Barnaby Project website and view all of the images shared at the Advisory Stakeholder meeting. 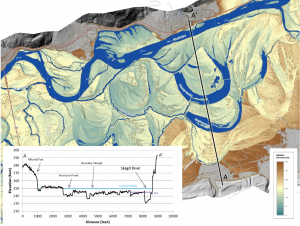 The following image includes a graph showing how the elevations of the Skagit River and points across our neighborhood descend along the sloping floodplain. 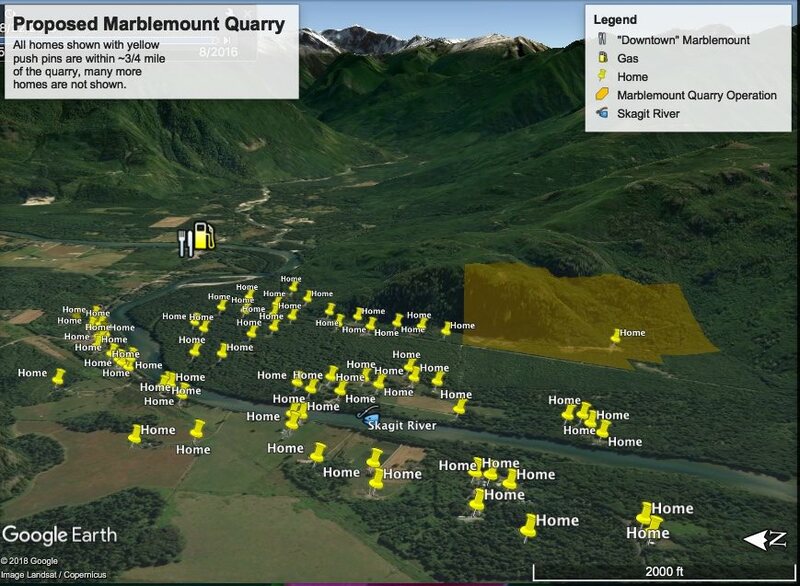 This information captures the vulnerability many of us feel around any project development or feature which would divert Skagit River flow southwestward across the valley toward our neighborhood. 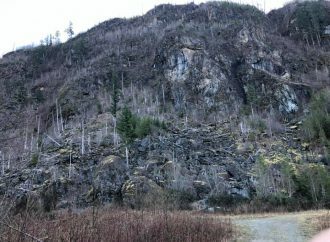 You can see that the west side of Barnaby Slough is about 245′ elevation and Martin Road is about 235′. Though located outside the current FEMA 100 year flood zone, there are several homes situated at the same elevation as the Barnaby which we know will be exposed to greater risk of flooding in the event of a catastrophic flood event. The valley floor in this area is a relatively flat, sloping plane and it would not take much in the way of a major flood event for the Skagit to change direction from its current east-west path and assume a new path across the valley through our residential neighborhood, especially if this project was to include features intended to divert river flow southwestward toward us. The Sauk River is considered to be, “the largest contribution to major flood events” in the area. Tim Abbe explained that this is because the Sauk is oriented in a north-south direction. “It capture more of the atmospheric river precipition responsible for fueling most of the largest floods.” Quotes are from meeting report minutes viewable at https://barnabystudy.wordpress.com. This graphic shows historical Skagit River peak flows going back to 1975 at three locations, Concrete, Marblemount and the Sauk River. 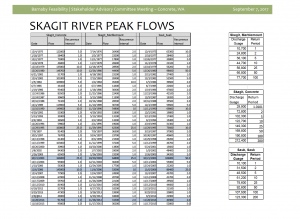 Some of us are concerned that any modeling of the river needs to include historical information reflecting known significant peak flows. Howard Stafford said, “My biggest concern is that with the models they’re making, they’re not going back to get all the information that is available. They’re not going far enough back on the flood situation. They should be going back to ’89-’90. They’re going to find out that that is some of the highest water that we’ve ever had here.” (Click image to enlarge). 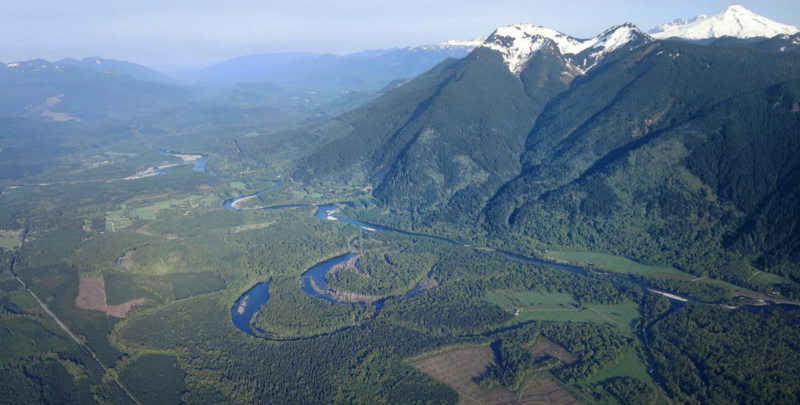 Though the design idea of constructing a substantial channel to divert significant Skagit River flow into the Barnaby Slough has been tabled for now, the possibility that it would be incorporated into new project plans, leads us to remain vigilant against such ideas. Our consultations with experts in risk analysis leave us fully aware that something like a channel would increase the probability of harm from catastrophic events AND magnify the extent of harm. A problem here is that no one can fully know in advance what would actually occur. What some of us who live and work in the project area do know is that we won’t support any plan that increases our exposure to harm, regardless of any regulatory or political project evaluation criteria. Follow us on Facebook to be informed of the time, date and place of a community meeting planned for December. It will likely be at Howard Miller Park on a weeknight. There will be flyers up as well. That meeting will include a report on the results of a local flood and drainage study. Our public Facebook page is the same as the name of this website: Skagit Upriver Neighbors. We will post an announcement of the meeting here. Credit for aerial photo of project area: Sharon Brady (April, 2016).